If you believe in the quality of the products you have on display, then you should make your potential customers believe in it too. So in trade shows, expos and product demos, whether held at a convention centre, expo hall, hotel or shopping centre, you need to display your products in such a way that they will look irresistible to your target consumers. To do that, you have to use a classy, distinctive branded table cover for the surfaces holding them. We have stretch tablecloths for cocktail tables that will make your display more elegant. Our stretch table cloth is definitely elegant, great for tables sized 30″, 36″ and 48″. It hugs the shape of the cocktail table, giving it a sensuous silhouette. The fabric of this tablecloth is also soft and substantial to the touch. With a thickness of 210gsm, this cloth is much thicker than the ones mostly offered in the market right now. The tablecloth’s printing is also superb. The details of your corporate logo, when printed on this cloth, will come alive. The colours are also accurate and brilliant. The reason for this is we use dye sublimation technology in producing our table covers. Dye sublimation is known to be the most sophisticated fabric printing technology in the industry today. Dye sublimation works using extreme levels of heat and pressure. The heat and pressure forces ink to sublimate – that is, to transform directly to gas from its solid state, completely skipping the liquid state. To produce the printout, a mirror likeness of the desired image, your corporate logo in this case, is printed onto heat-resistant transfer paper. The paper is pressed onto the fabric using a machine that delivers the required heat and pressure. As the ink on the transfer paper sublimates to gas, it infuses the fibres of the fabric to create a permanent printout. The resulting product is highly resistant to fading and cracking. You can use it as often as you want without worrying about the colours paling in brilliance or the image getting damaged. 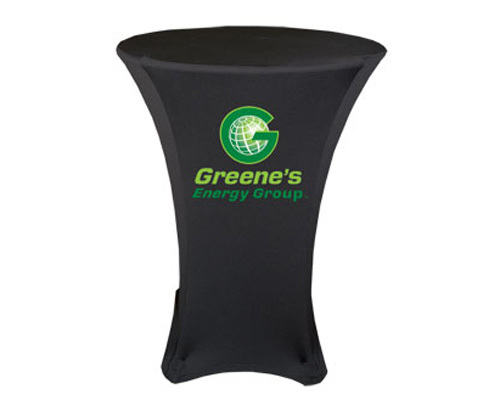 And because this table cover looks great, you can use it not just for displaying your product at expos and trade shows. You can also use it at corporate events, product demos, and even for decorating your store or workplace. With this level of elegance our table covers have, you’d be pleased to know that their price fits your budget. They will even help you save money on the cost of decorating your exhibition booths. That’s because, for one, we offer only full-colour printing, and we offer it at a low price. We don’t charge climbing rates for every additional colour printed, so our product comes out cheaper. For another, we don’t charge extra fees for not meeting our minimum required order. Actually, we don’t even have a minimum order requirement. So if you want just one stretch table cloth, feel free to order only one. Why should you spend for items you won’t have a use for? Lastly, as mentioned above, you’ll have multiple uses for this table throw and you can use it anywhere. And you can use it as frequently as you want because it’s fade- and damage-resistant. The biggest benefit you will have when you order a tablecloth from us is you get to control how the end product will come out. You provide us with the design or we can lay it out for you. Moreover, you get to choose the exact colour the table cover will have using the Pantone colour chart. For example, if you want a green table cloth, you can give us its Pantone code to determine whether the specific shade of green you want is lime green, acid green, forest green, moss green, olive green, army green, asparagus, avocado, celadon, emerald or any other hue. To make sure the end product will be perfect, you can ask us to produce a sample print before we proceed work with the final product. Elegant and vibrant, our printed cocktail tablecloth will add distinction to your exhibition booth and other displays. Call us right now for more information on this product.